Posted April 9, 2016 by HPGhotrodLogin & filed under Uncategorized. Fellow hobbyists, this is how we got what we got! 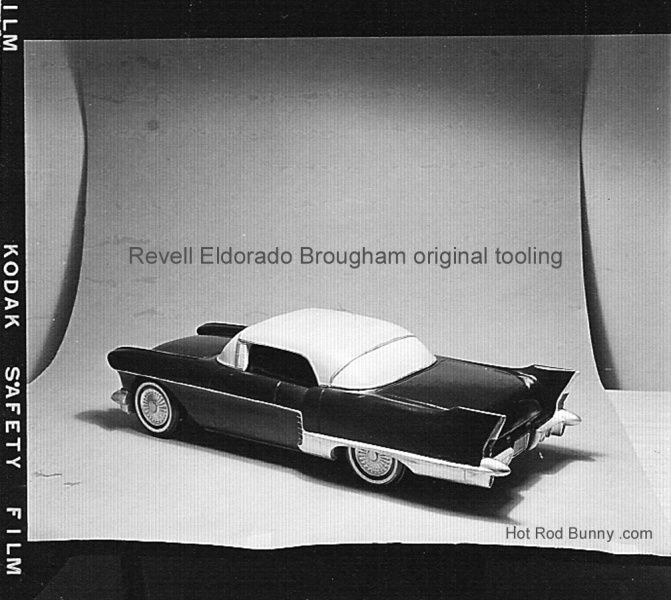 Not many people know it but Revell didn’t set out to make a model of the production 1957 Eldorado Brougham sedan. Their original idea was to make the Brougham Town Car from the 1956 GM Motorama. For those of you who don’t know, the Motorama was a traveling auto show put on by GM that featured all the new production cars, futuristic show cars and dancing girls. (The latter not assembled by GM.) The folks at Revell probably set out to make a companion piece to their Pontiac Club De Mer kit, a Pontiac show car that was also a featured at the Motorama in 1956. AMT/Revell had already established a relationship with Cadillac division by making beautiful and well proportioned 1/32 scale models of the 1955 and 1956 Eldorado convertibles so when Jack Campbell from Revell sent a letter of introduction to H. Edward Faulkner, Director of Public Relations at Cadillac, it was probably assumed that things would go smoothly. Unfortunately they didn’t. Here is an excerpt from his letter of April 10th 1956. “High on our list of cars that we have contemplated adding to our line of plastic scale models kits is the Cadillac Brougham Town car”. Jack then asked for drawings and detailed photographs of the Brougham Town car. The letter back from Mr. Faulkner of Cadillac was more of a form letter and he didn’t seem to grasp what Jack was asking for. 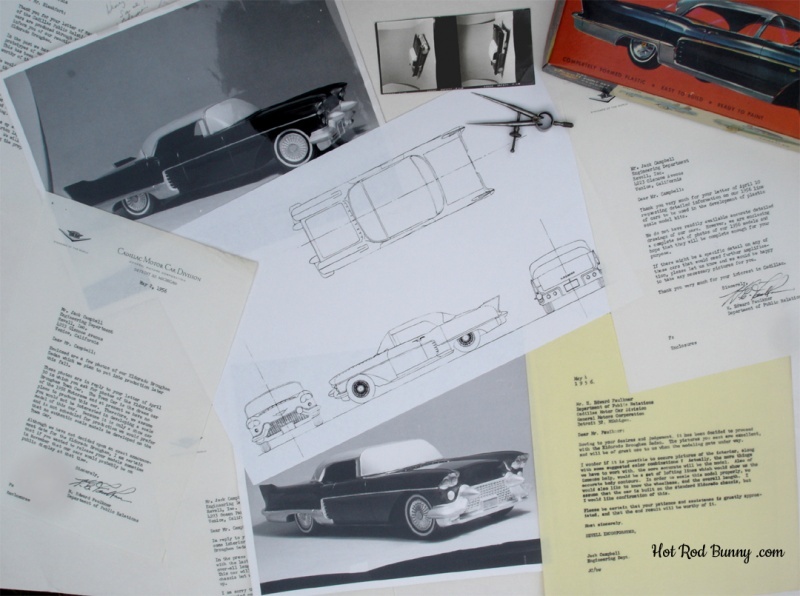 “Thank you very much for your letter of April 10 requesting detailed information on our 1956 line of cars to be used in the development of plastic scale model kits. We do not have readily available accurate detailed drawing of our cars. However, we are enclosing a complete set of photos of our 1956 models…” Now apparently Revell and /or AMT did use the publicity photographs of the ’56 Eldorado Biarritz since they produced the kit in 1/32 scale as a joint effort. But Jack still didn’t have what he was asking for and sent off a letter to Mr. Faulkner requesting the information on the Town Car a second time. April 30 1956, “Many thanks for the photographs of the Cadillac line, but unfortunately, the Brougham Town Car, in which we are primarily interested is not included.” Jack then continues to assure Mr. Faulkner that Revell can be trusted with proprietary information and then sites their work with the aircraft companies and U.S. Government agencies on restricted items. On May 2 1956 H Edward Faulkner sends a letter back to Jack Campbell with the bad news. “Enclosed are a few photos of our Eldorado Brougham Sedan which we plan to put into production later this fall. These photos are in reply to your April 30 letter in which you ask for photos of the Eldorado Brougham Town Car. The Town Car is the dream car of the 1956 Motorama and at present we have no plans to produce this car. Because it is only a show car and is not scheduled for production we would prefer that no authentic scale models be developed on the Town Car”. Well, that slammed the door on the show car idea! There was to be no companion piece for the Pontiac Club De Mer! On May 4, 1956 Jack sent back a letter to Mr. Faulkner. “Bowing to your desires and judgment, it has been decided to proceed with the Eldorado Brougham Sedan”. Jack then asks for some interior shots, lofting lines of the body contours and speculated on the car being produced on the standard Eldorado frame. A letter back from Mr. Faulkner straightens out that idea. “This car will not be built on the standard Eldorado chassis but will be completely new from the ground up”. For the next several months Revell began the long process of engineering the kit. A set of drawings was made in June of 1956. Presumably without the much needed lofting lines. The proportions and details were not up to the standard that Revell had established on the 1955 and 1956 models, not to mention the 1957 Ford Country Squire. The engineering on this kit was to be different than the previous products. There was an attempt to make the body in two large pieces that split along the body contour lines and not with a separate hood, sides etc. This method was tried on both the Brougham and the Club De Mer. The latter kit more successfully. The drawings showed a crude version of the Cadillac Saber Spoke wheels. The engineer was trying to make the special Kelsey-Hayes “Saber-Spoke” magnesium wheels that the other Eldorados in the product line used. These were used on the 1957 Brougham also at first but Cadillac wanted a different wheel for the Brougham. By 1958 all Broughams had the new wheels. You can see by the original Revell drawings that they were close but not close enough to the Saber-Spoke wheel. When these drawings were translated into the tooling master it lost a little more accuracy. The photos show the original master and the crudeness of the model at that stage. The grille detail is really a piece of paper with the “egg crate” texture drawn on. Note that the rocker molding is not correct at this point. From what I can gather from the records, Cadillac never provided anything but publicity stills and color charts. The folks at Revell had to do their own scale drawings. Whether they used the photos and acquired a car to measure is unknown but that seems unlikely. They were close on the drawings but not exact and when Cadillac saw them they weren’t impressed. They gave a scathing review of the drawings and were inclined to drop the project all together. Revell again asked for blueprints but apparently never got them. The wheels were completely wrong, a sore spot with Cadillac, and the fin detail was incorrect as well as some other parts. Changes had to be made in order to gain approval. The wheels in the kit are correct for the Brougham so they apparently did receive the information needed for them. To add insult to injury Cadillac Motor Division had a major policy change about the use of the logos and crests that took effect at the first of the year in 1957. That is why the proper script and crest appear on the 1955 and 1956 Eldorado kits but they didn’t on the Brougham kit box. Yet another bit of bad luck. Those logos are necessary to add credibility to the finished product. 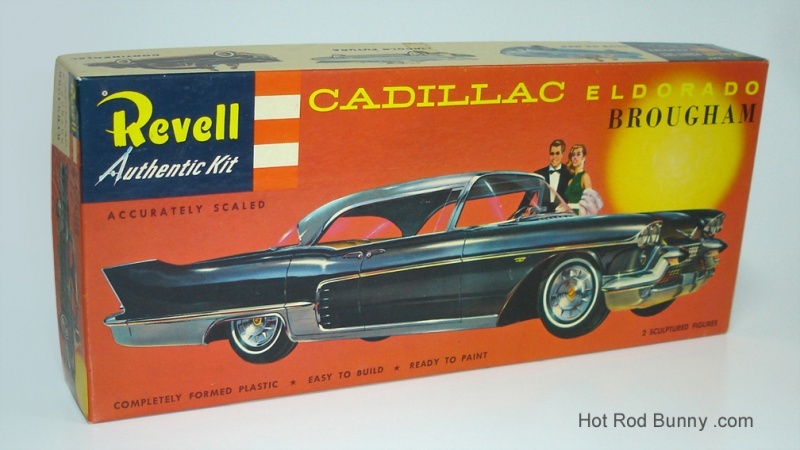 It was necessary then for Revell to print Cadillac on the box rather than use the official Cadillac script. The box illustration was beautiful and promised much but unfortunately the kit did not deliver. That is usually the case with lesser manufacturers such as Palmer and Premier but not with Revell. They had a pair of engineering dividers in their logo for Pete’s sake and had an established reputation for well-crafted model kits. The future held great things for Revell and they soon re-acquired their mantle of accuracy and quality with the Ford Retractable, the Corvette and Austin Healey kits. They also notably abandoned the clam-shell kit body and resumed the multi-piece body construction. 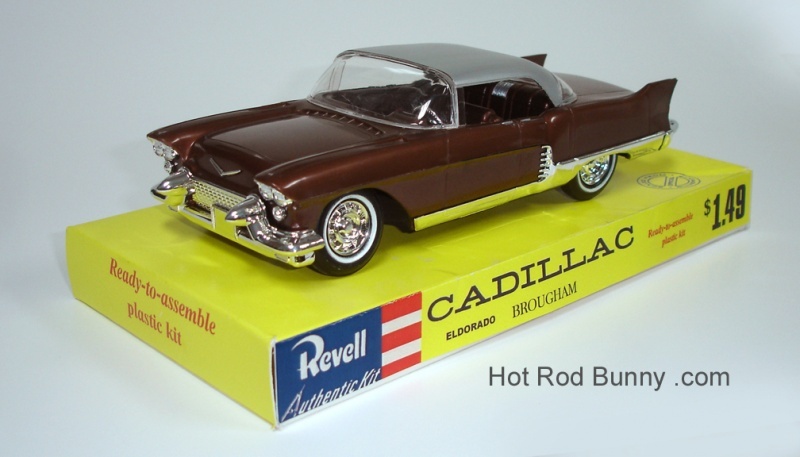 Revell made no other Cadillac models, which is a shame. Can you imagine a Cadillac kit with the same attention to detail that their 1955 Chevy Bel Air had? In the late 1980’s one of the designers working for Revell, Brian Bordon, was pushing to have the vintage kits re-issued. (Later called the SSP kit line.) 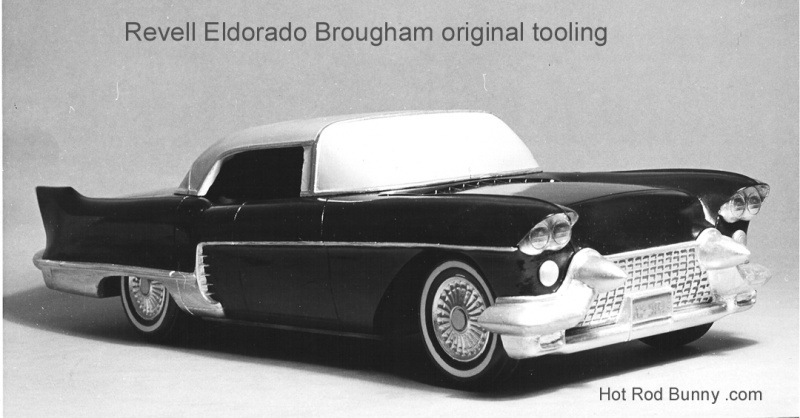 One of the kits he was requesting was the Eldorado Brougham. They dusted off the molds and ran a few test shots to see if the tooling was in proper working order. The plastic used was the same copper color that the ‘57 Nomad was issued in back in 1978. The photos below are of an assembled kit I built from one of the test shots. The Brougham kit was issued both times in black plastic. Brian Bordon was a close personal friend and gave several test shots to me as a gift since I was a big Cadillac fan. The Brougham kit was not re-issued at that time. Sadly, Brian died before the kit was eventually issued in 1996. Now, when you see that old Eldorado Brougham kit you will know a little bit more about it’s journey to reality, a long road strewn with potholes! Here is a collection of the materials used to research this article. Everything was from the Revell archives. If you like vintage car stories, purchase a copy of Hot Rod Bunny. It’s not just for kids! Brian Borden was my best friend at Art Center when we attended that college. We remained best friends when we graduated, he working at Revell, and I in Beverly Hills. I remember his studio apartment’s kitchen cabinets were filled with model cars in their original boxes! I’ll never forget his humor, his love of automobiles and life. Thanks a lot for a very interesting article! 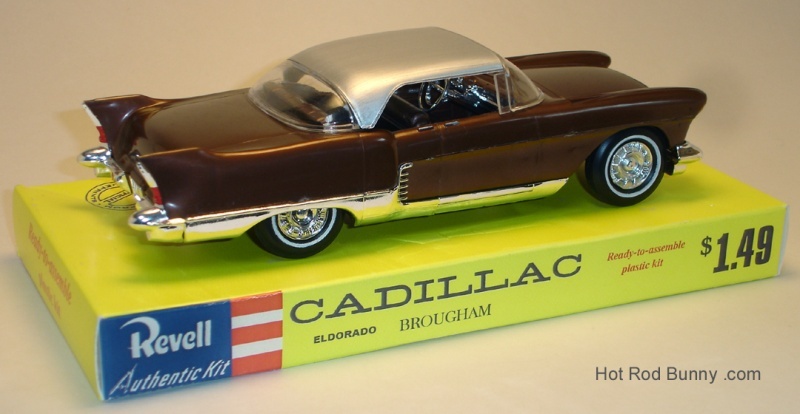 Have just finished the new released Cadillac Brougham kit.